A website for you and what you desire. 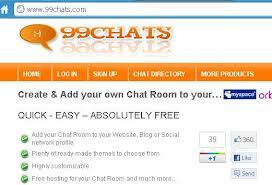 Just free and free host by 99chats.com website. Login and create a room and get code and use it anywhere you want. Also see "chat directory" for different chat groups. You can get your own chat room here, it's a site like Xat; just gives free chat groups and you can get your own and put it to your website. Click here to enter email and password, then login to 99chats and get your own group.